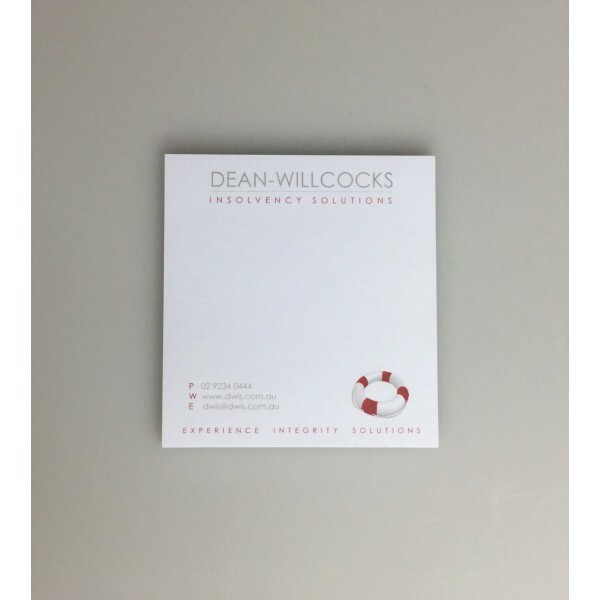 Purchase custom printed sticky Post-it® Notes with a 2colour custom print. The custom print is on each individual page of the sticky note pad. This product is made in Australia and delivered within Australia only.This sticky note size is the most popular size of sticky note. It offers plenty of writing room as well as a perfect compact size for you to have on your desk, in your pocket or carried around in a compendium. To brand your artwork we require your artfile to be emailed to us in an Adobe EPS or Adobe PDF or Adobe Ai file format. All file formats need to be saved with vectorised outlines. If you may only have a jpeg file, we can convert your logo for a small fee. Please enquire. The displayed price includes a custom 2 colour print of your graphic. There is no print set up. Prices do exclude Australian GST. The standard turnaround time for sticky notes is 2 weeks. If you desire your sticky notes to be delivered faster, please let us know at the time of ordering for an express turnaround time.